The Coalition invasion and subsequent occupation of Iraq in 2003 led to a US military stabilization force remaining in the country for over a decade. This occupying force had to face the challenge of both fighting an insurgency as well as to carry out policing duties, including the management of thousands of men housed in an internment known as ‘TIF’ – Theater Internment Camp. With thousands of men interned in these camps, little to do, and poor conditions, inevitably there were fights and a significant problem with large scale disorder. Rather than tackle the inherent problem of the camps it was decided that there was, instead, a need for armed intervention inside these camps in order to maintain order. 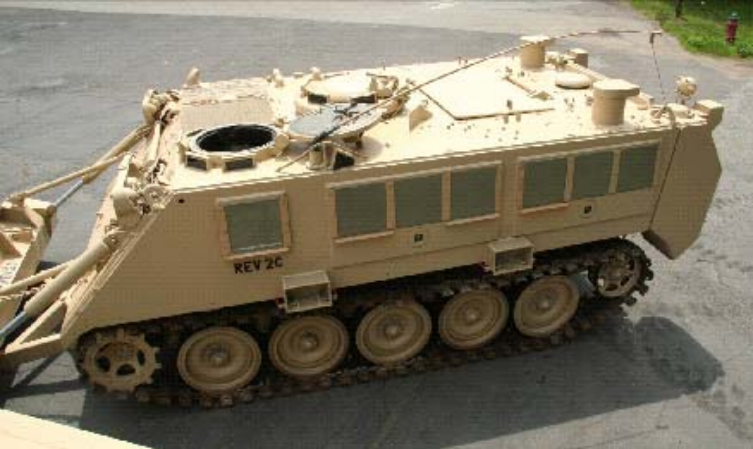 The M113 REV2 was the outcome of this ‘need’. 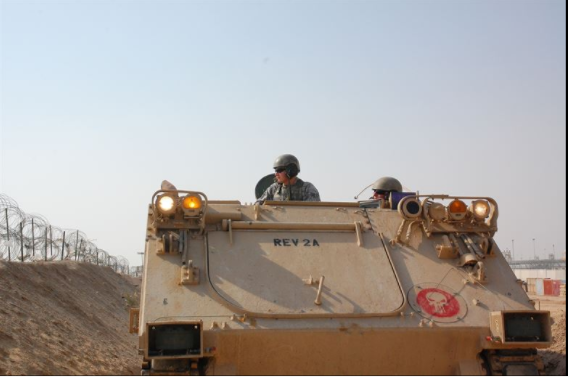 EM113REV2 Vehicle A without its bulldozer blade at Camp Bucca, Iraq. The vehicle is crewed by US Air Force personnel from the 886th Expeditionary Security Force. Source: Fairchild Air Force Base News. In 2005, the US Army’s Armament Research Development and Engineering Center at Picatinny Arsenal, New Jersey, started examining methods of entering internment camps where prisoners and detainees taken during the invasion of Iraq were held. Some of these camps had generated widespread disorder and taking armed Military Police into them posed the danger of the prisoners getting hold of lethal munitions. There was a secondary potential for using this vehicle for crowd control externally in riots as well. 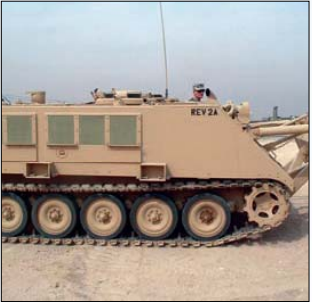 The vehicles chosen for modification were Canadian M113A2’s, although why Canadian vehicles were selected is unclear. Converted, these would be redesignated ‘EM113A2 Rapid Entry Vehicle 2 (REV2)’. Four vehicles were converted and named EM113A2 REV 2A, B, C, and D respectively. Fitted with their bulldozer blade attachment, they were known as ‘SPIRAL 2’. The name had no relation at all to the SPIRAL cased telescoped ammunition development project. The vehicles were fitted with a bulldozer attachment to assist in clearing barricades. In order to allow them to be used with the hatches closed, improved periscopes were also fitted. The most obvious modification is that on the left and right-hand sides of the vehicle where large sections of the aluminum armor were cut out. Into these portals were put two large 3-panel windows in the troop compartment and a single window in the side of the crew space. Within the rear two panels was mounted a single firing port for a crew served weapon. No firing port was provided for the crew compartment. 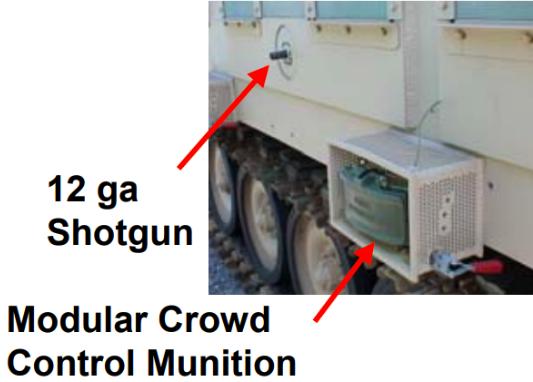 Below these two portals, on the bottom of the sidewall of the vehicle, were two boxes into which an M5 Modular Crowd Control Munition (MCCM) was placed. These could be detonated by the operators inside. Two further box-mounted MCCMs were fitted at the front, one on each corner for a total of 6 of these weapons. It appears, however, that the MCCM holders were added later, possibly in-theater, following the removal of the bulldozer blade as previous photos show the blade itself as mounting the two MCCM holders. The range of the M5 MCCM is about 30 meters in an arc 60 – 80 degrees wide with a minimum safe distance of about 5 meters and is likely to cause blunt trauma injuries up to 15 meters away. Below this distance, the chance of people, likely in an unarmed crowd, being killed is very high. An additional hazard is the height at which the weapons are placed. According to GTA 10-01-004 ‘Nonlethal capabilities – M5 MCCM’ published by the US Army in 2001, the device may be lethal within 5 meters and should be placed on the ground or not more than 30 centimeters above it. In this way, the dispersal of the balls is clearly targeting the ankles, feet and lower legs of the crowd. This was far less likely to cause serious injury or death than one at adult-waist height is going to. The weapon ports fitted were of the same type as on the M2 Bradley Infantry Fighting Vehicle (IFV) and fitted with specially modified M870 Remington model 870 12-gauge pump action shotguns with a steel receiver. The guns had their barrels shortened and fitted with the M231 firing port adapter collar taken from the M231 Firing Port weapon from the M2 Bradley IFV. The shotguns could then be threaded into the firing port in the same manner as the 5.56mm firing port weapons on the Bradley had done. 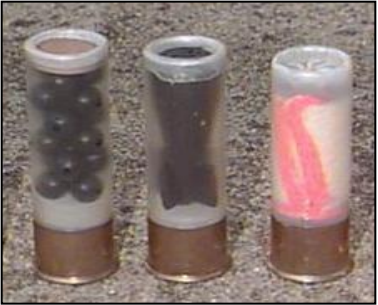 Standard lethal ammunition (00 ‘double-ought’ Buckshot) was available, as were non-lethal 12-gauge rounds including ‘Stingball’ (rubber balls) for area targets 10-30 metres away, a Fin-Stabilized round (single rubber sabot) for individual targets up to 20 metres away, and a Sock Round (weighed bag) for targets 30 to 55 metres away. 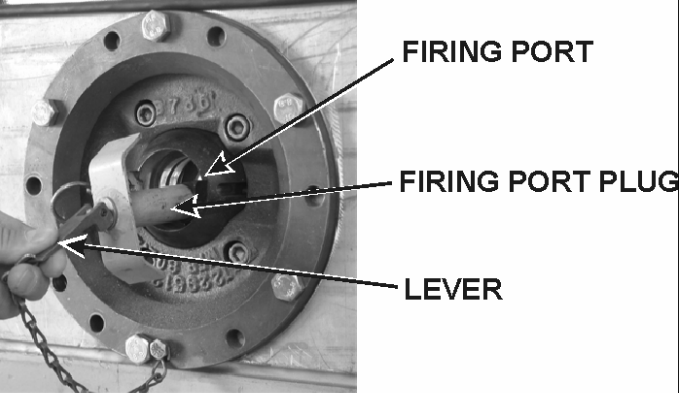 Early tests with the non-lethal ammunition caused damage to the magazine support and barrel, and as a result, some further modifications were made. The collar was welded in place to the barrel, a new support was welded over the end of the magazine tube to the barrel to stop it detaching and some additional welds and screws were added to hold the barrel and magazine support in place. An attempt to add a second spring to help in recoil absorption was abandoned and the final weapon design settled upon. Just 5 such guns were made though, only enough for one vehicle plus one spare. The shotguns were fixed within the vehicle and were attached to the ventilation system taken from the early M2 Bradley IFV. 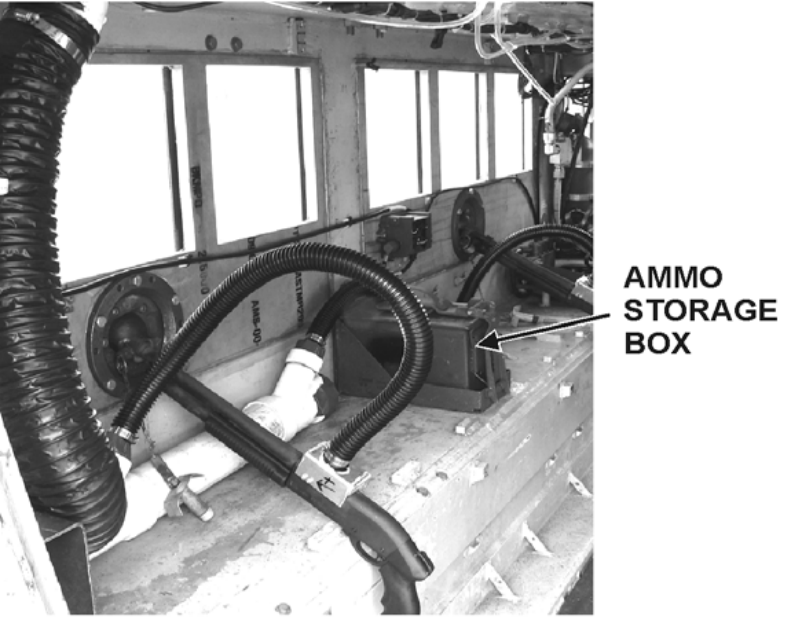 These would vent the gases produced during firing, although a custom made fume hood had to be designed and fabricated from aluminum and mounted on the shotgun to attach to the fume extractors. Left to right. 12-gauge ‘non-lethal’ rounds. M1013 Area Round nicknamed ‘Stingball’, M1012 Point Round (Fin-Stabilized rubber bullet), and the ‘Sock’ round (a type of bean bag round). Source: JNLWP 2012. The EM113A2 Rapid Entry Vehicle 2 (REV 2). Note the M5 Modular Crowd Control Munition (MCCM) mines mounted to the sides of the vehicle, and the ports for the shotguns. The same EM113 REV2 in SPIRAL 2 configuration with dozer blade mounted. Both illustrations were produced by Andrei ‘Octo10’ Kirushkin, funded by our Patreon Campaign. 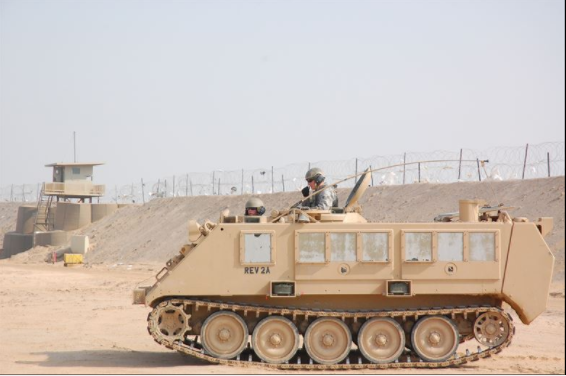 There were four M113A2’s converted for use at TIC, but it is not known how much, if any use they got for the intended purpose of riot control, although there were problems at Camp Bucca before and after their deployment. It is not known if the vehicles were ever used outside the base or not, but the project was officially a success. The design team was awarded a prize for one of the top 10 military inventions of the year and two patents were applied for, one for the vehicle modification and another for the shotgun modification. Camp Bucca was closed in September 2009, but these vehicles do not seem to have been left there and are assumed to have been repatriated to the United States. Their location is not known. Sec: 2 portable M60 0.3 in (7.62 mm) – see notes. International Infantry and Joint Services Small Arms System Symposium, Exhibition, and Firing Demonstration ‘Enhancing Small Arms Effectiveness in Current and Future Operations. (2008). National Defense Industrial Association. Armaments Technology Seminar and Exhibition ‘Joint Munitions and Lethality Life cycle Management Command’. (2007). National Defense Industrial Association. US Army Armament Research, Development, and Engineering Center (ARDEC) Update. (2007). Anthony Sebasto. ARDEC. AMC Small Business Program. (2007). General Benjamin Griffen. US Army Materiel Command. Non-Lethal Weapons (NLW) Reference Book. (2012). Nonlethal Capabilities, M5 MCCM. (2001). Headquarters, Department of the Army, US Army Training Support Command. They probably took Canadian M113A2 as they were already equiped with external fuel cell and the dozer blade systems.